We just had an Hour of Code discussion on #gafechat (moderated by Jaime Chanter) There were some great ideas and resources shared by some amazing educators. 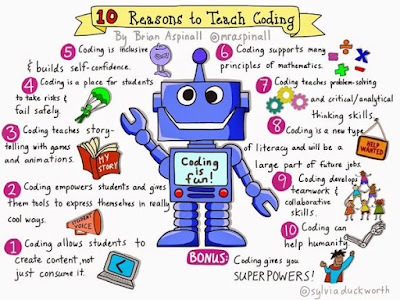 Hour of Code is more than just having students play with blocks. While I could go into all the benefits, I feel the picture that Sylvia Duckworth created from Brian Aspinall's list says it all. While there were a lot of resources and ideas shared during the chat. Here are some of the main ones I want to highlight (you can view the full #gafechat Hour of Code discussion here). I am the Instructional Coach at Rouse High School in Leander ISD. Go Raiders! I am passionate about educating students and teachers and all your can do with devices. I certainly don't believe that paper should never be used, but I do believe that a device can open up a world of possibilities. I am also active on Twitter and my website is filled with resources.